If you truly want a large whiteboard then you should consider painting a white board surface. If you haven’t heard of the product before then you are in for a surprise. There are now paints that can turn nearly any surface into a dry erase capable area. Do you have a custom shape or a really large area that you would like to use dry erase markers on? Do you want more than 32 square feet of useable surface but don’t want to pay several hundred or even thousands of dollars? If so, this is the way to go. With a little bit of surface preparation you can have an entire wall used as a white board. Most of the time the paint is ready to go on any wall, but for the best results you generally want to lightly sand the area to ensure a smooth surface – textured walls can decrease the ease of erasing. Additionally, most of these paints are fairly low odor – although as with any paint it is recommended that you provide adequate ventilation when applying and letting the paint cure. So, just how long does it take to do this? Is it a huge effort that requires skills and equipment? Not at all! Start with the surface preparation and make sure the area is clean and as smooth as you want it. After mixing the paint and allowing for the air bubbles to work their way out you are ready to go. Depending on what are you want to paint you may need to tape off a section so that you do not paint over trim or other objects. Then you are ready to paint. IdeaPaint is applied like any other paint and can be easily done by anyone, even if you have never painted before – it’s easy! After a couple of days of drying time to let the paint fully cure it is ready to use! This is a really impressive route to take for a large whiteboard surface – imagine having an entire wall in your home or office to use. 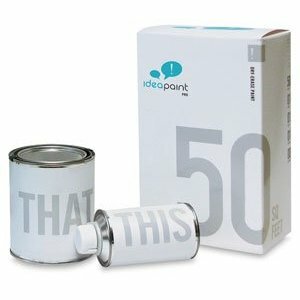 Many people have used this paint for brainstorming and collaboration areas, as well as parents who have painted children’s rooms or walls in the house to use as communication areas. Dry erase paint can go in a large number of areas – not just walls. People have painted desks, ceilings, boxes, and more with the paint. If the surface is very porous it may be necessary to first apply a few coats of primer to help the whiteboard paint adhere and not be completely soaked up by the underlying surface. If you are in the market for a huge whiteboard, or want to put a dry erase surface in a non standard area, then this is the one for you. For the price that is the fraction of a very large whiteboard you can turn a much larger area into your own whiteboard wall.